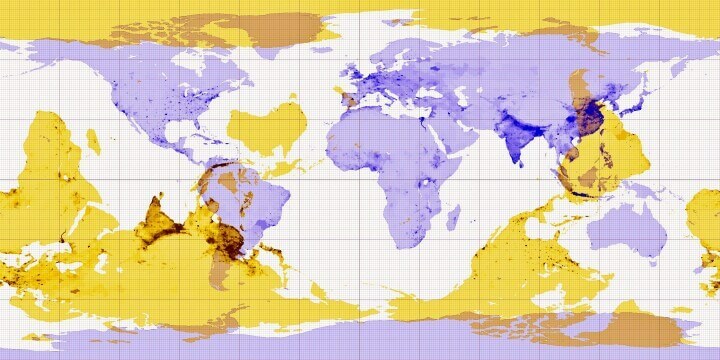 The map above shows where you’d end up if you dug a tunnel straight through the earth and came out the other side. In geography, points on the other side of the world are known as antipodes. If you dig from any point in the US you will not end up in China. Most likely you’ll end up somewhere in the Indian ocean. 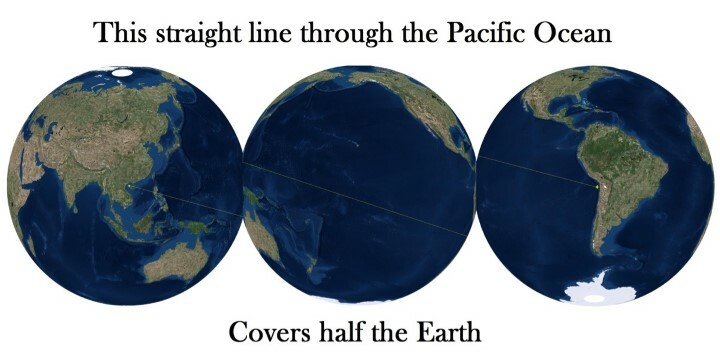 Similarly, most Europeans and Africans would end up in the Pacific Ocean. Australians, who along with New Zealanders are sometimes referred to as Antipodeans, would end up in the Atlantic. Of course ending up in an Ocean makes sense when you consider that roughly 71% of the earth is water and only 29% is land. The good news is that most Kiwis would end up in Spain. The the Malay Archipelago is antipodal to the Amazon Basin. Greenland and the Canadian Arctic Archipelago are antipodal to East Antarctica. The countries with the most other countries as Antipodes are: New Zealand (12), France (12), Brazil (9), Indonesia (8), Peru (7), United States (7), United Kingdom (7) and China (6). Approximately 15% of land territory is antipodal to other land, representing approximately 4.4% of the Earth’s surface. If you want even more facts and information have a look at the Wikipedia’s antipodes page. One final interesting fact, that shows just how big the Pacific Ocean is, is that it contains its own antipodes. Enjoy the weird world of antipodes? Then please share this post with a friend. The map is very misleading. Why would the yellow continental mass be “upside down”? Backwards yes, but the poles wouldn’t flip. The furthest point on the globe from another point will not be in the same hemisphere. If you started on the Arctic Circle, you would end up on the Antarctic Circle. So yes, the poles do flip.